High-end giclée printing is maybe the most important art reproduction method in use today, yet many artists and art lovers do not really understand its unique characteristics and benefits. Giclée (pronounced “zhee-clay”) can allow artists on a budget to explore the print market; it can produce reproductions over many separate runs, large or small, which are identical to each other; and it can open up whole new audiences to artists and galleries. In the past few years, giclée printing has achieved greater acceptance in the international art world and Salt Lake City’s art community is no exception. 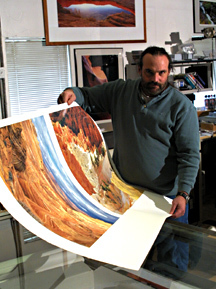 Thanks to the work of local printers like photographer Mark Weiler, giclée printing has become more popular among Utah artists. Al Rounds, Denis Phillips, Roger Newbold, Willamarie Huelskamp and Susan Swartz have all printed with Mark. Besides being a technically outstanding printer, Mark is a passionate, talented artist, concentrating much of his own work in photography, but also working with sculpture and other art forms. Giclée means “to spray,” so even desktop ink-jet printers fit into the category. The Iris printer is a high-end version of the process, which uses hundreds of thousands of dollars worth of superior image-producing technology. An Iris Giclée print is produced by a system of camera-scanners, digital files, sophisticated color correction, vibrating crystals, highly-stable inks, almost any flexible material as a printing surface, and a highly-trained and talented craftsman. To create a giclée print requires that the original art first be converted into digital form. This may be done directly, by high-end digital capture (often a drum scan), or indirectly, with a large-format camera. The digital image is then cleaned up and color balanced against the original piece – not always an easy process. Next comes the actual printing. The material to receive the image is attached to a large drum. A variety of archival papers as well as canvas are most commonly used. However, artists can choose literally any material up to 34” x 47” that can be attached to the drum, including leather, foil, silk, veneer and other exotic surfaces. The drum rotates at a high rate while cyan, magenta, yellow and black inks are sprayed onto the surface. The four print heads mix and spray ink through vibrating nozzles of quartz. The nozzles spray 4 million droplets of ink per second onto the substrate paper or canvas, each one smaller than a human red blood cell. Each of the four colors is being sprayed continuously, with varying ink density producing the amazing range of color. The results, at 1800 dpi, are incredibly accurate color renditions of hue, value and density in 7 million colors – effectively continuous tones. Neither serigraphy nor color lithography can touch it. With inks stable to well over twenty years, a Giclée print can even outlast an original watercolor! Photographers like Mark Weiler love giclée because it offers them a printing method that can actually reproduce all of the stops that their film originally captured! And it opens up a whole new world of print surface textures, previously out of photography¹s grasp. Luckily for Utah artists and art lovers, Mark Weiler not only produces his own giclée prints but also offers his services to other artists. Mark, the owner of The Art Is In (formerly ImageQuest), has been credited as one of the best Iris Giclée printers in the world, both by the company that manufactures the Iris and artists who have used other top Iris printers. Weiler charges $200 to pre-press a print job, including shooting the artwork and correcting the digital file (balancing, clean-up, etc. ), and $150 per 34×47 sheet (or $180 if printing on canvas). If the finished print is small, multiple copies can be ganged on one sheet, greatly reducing the per-image price. At these prices, it does not take many sales for an artist to recoup his/her original investment. Even though many prominent museums, like New York’s Metropolitan Museum, the Guggenheim, and the National Museum of Mexico, display giclées as part of their collections, many galleries are still opposed to them (and other forms of reproduction). Some feel that, by offering prints of their work, artists end up reducing the value of their originals. Mark Weiler disagrees. He believes that, because artists have to generate income, most end up having to sell their original work for less than they feel it is worth anyway. He also points out the difficulty for most artists in selling expensive artwork in Utah. Consequently, Weiler encourages artists to explore the possibilities of the print market, beginning with a few of their very best pieces. The unique giclée process allows an artist to get started without a major investment. Then, the artist can offer originals at full price and have high-quality, lower-priced reproductions as an alternative. As prints are sold, it is easy to order more in small quantities. 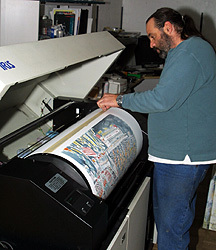 The artist pays only the $150 per sheet price – the pre-press job has all been saved on digital file. The artist gets on-demand additional prints, avoiding the burden of storage that comes with a lithography run. The art lover gets an affordable piece of art that can be proudly displayed and shared with friends and visitors. “What it does is make great art affordable”. You can call Mark at 801-466-2858, or visit The Art Is In studio just west of Franklin Covey Field, at 1425 So. Jefferson, Salt Lake City. This article appeared in the February 2002 edition of 15 Bytes. Steve Coray has a background in photojournalism and now runs his own business providing creative, affordable event and portrait photography to clients all along the Wasatch Front and beyond.